The DVX100 is an impressive camera with very good image quality and more detailed user control over image and audio settings than the "prosumer" 3-CCD cameras I have used before (eg. TRV900, GL1, VX2000). It was first sold in the US in October 2002. I got the camera on Nov. 8 2002. 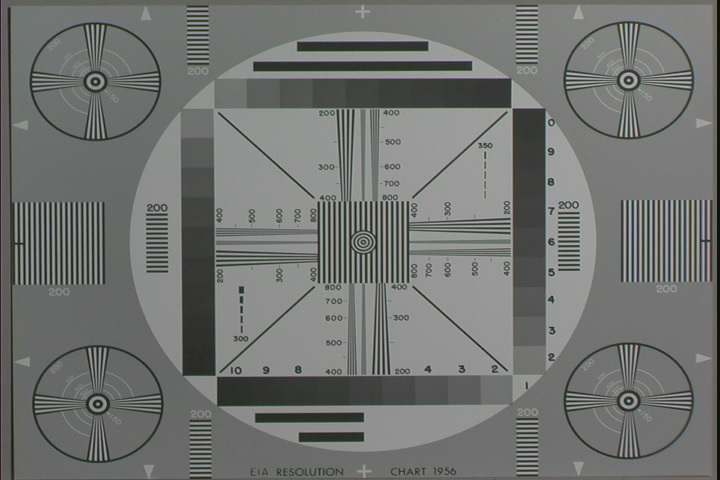 (Dec.6 2002) VX2k and DVX100 comparison images, normal and low light. (Dec.4 2002) Arctic Conditions report from Fred Thorsen. (Dec.1 2002) page showing effect of Gamma and Matrix controls. Adam Wilt maintains the most technically literate and informative DV web pages anywhere, and he recently got a DVX100. This is good news for anyone wanting accurate information about the camera: check out adamwilt.com. You can read the specs and download the full user's manual PDF file from Panasonic's page. 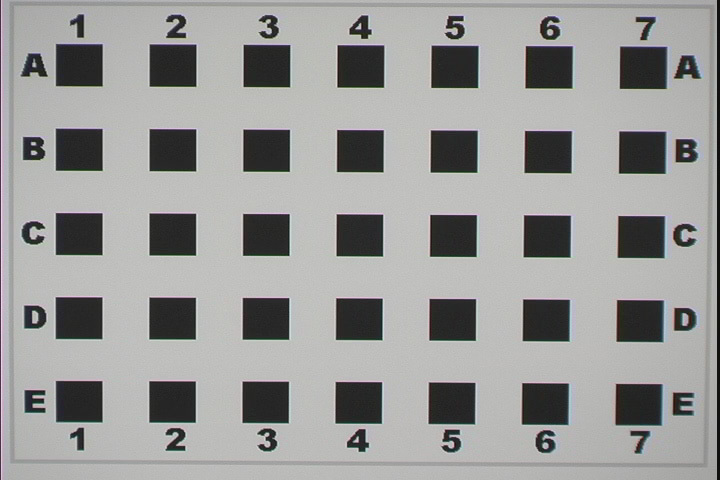 Videosystems.com has a good explanation of progressive scan, showing why true progressive cameras have more resolution even with the same number of recorded pixels (eg. 720x480 for NTSC DV) because they do not average two pixel rows like interlaced-mode cameras do, to generate each field. This also explains why progressive scan mode has exactly half the sensitivity (1 f-stop darker) as compared with interlaced mode. Lido at eyejazz.com has an excel file showing the default settings in each of the six user presets. There is an active user forum specific to the DVX100 at DVXUser.com and another at the 2-pop.com site. 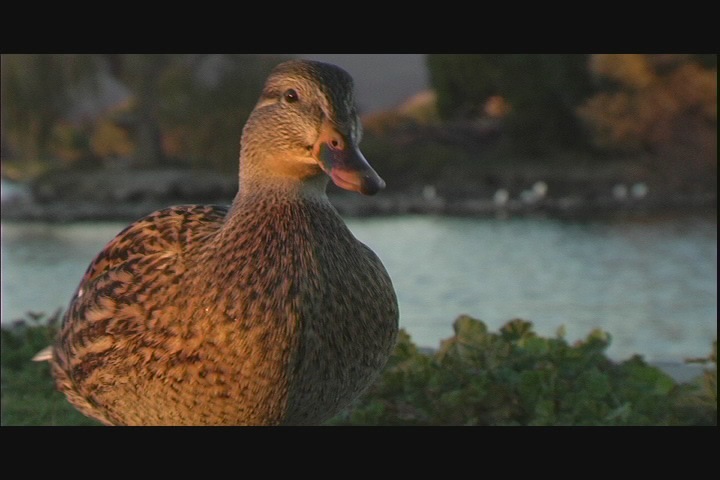 Here are a few frames in 16:9 mode:duck 1, duck 2. 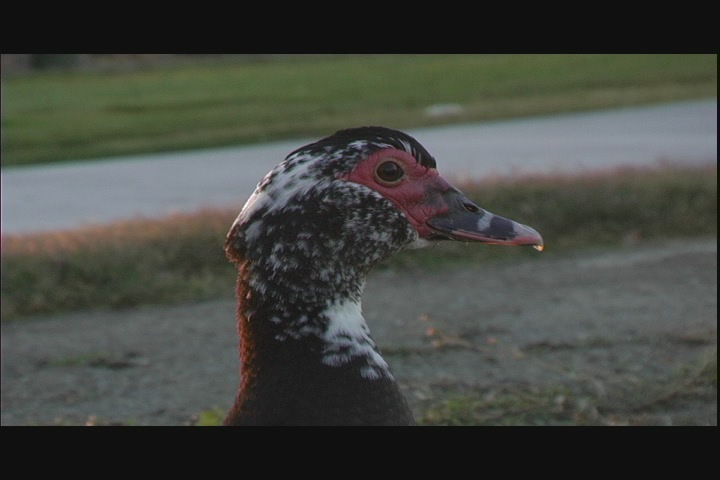 Here is a frame grab comparing the DVX100 and VX2000 cameras. For balancing the camera on a steadicam or similar device it is important to know the exact weight. I used a FedEx digital package scale to make some measurements of the camera in operating condition, as well as some of the parts separately. I did not have an external mic or mic clamp, tripod quick-release plate, matte box, cables or any other accessories which would add their own contribution to the weight. 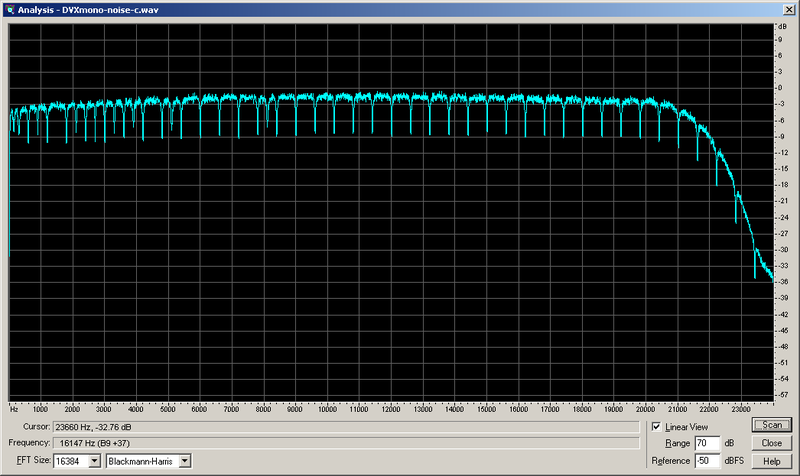 ohm resistor across the mic input). 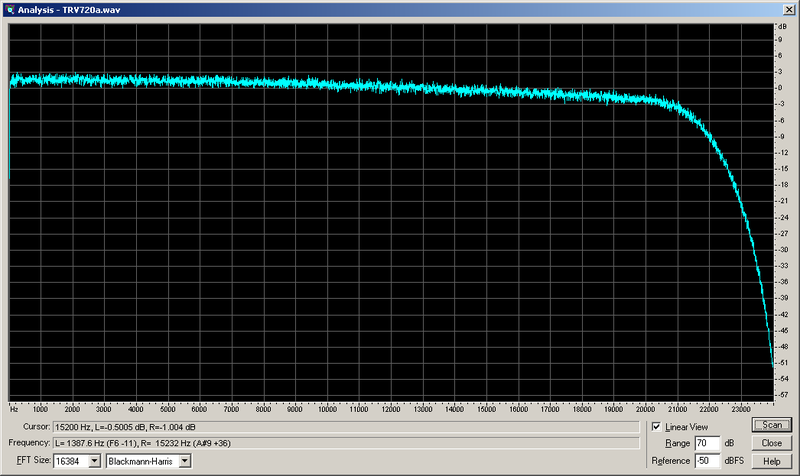 Using an "A" weighting filter the noise is -77 dBa. 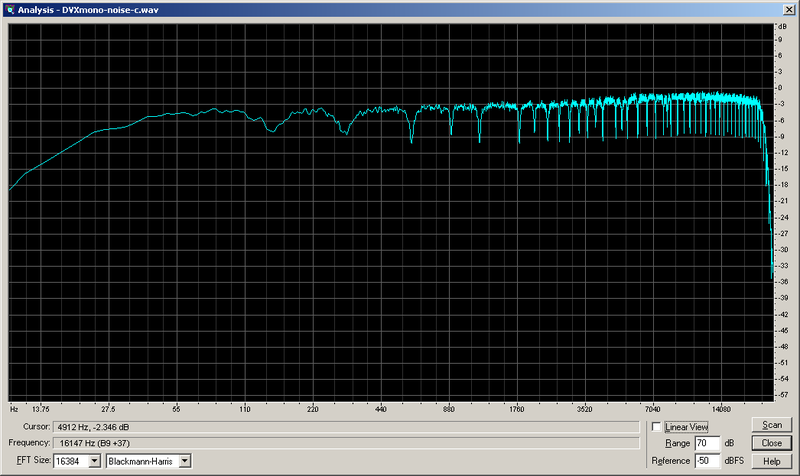 I have a description of the audio gain levels and ALC behavior here. view all spectra on one page. 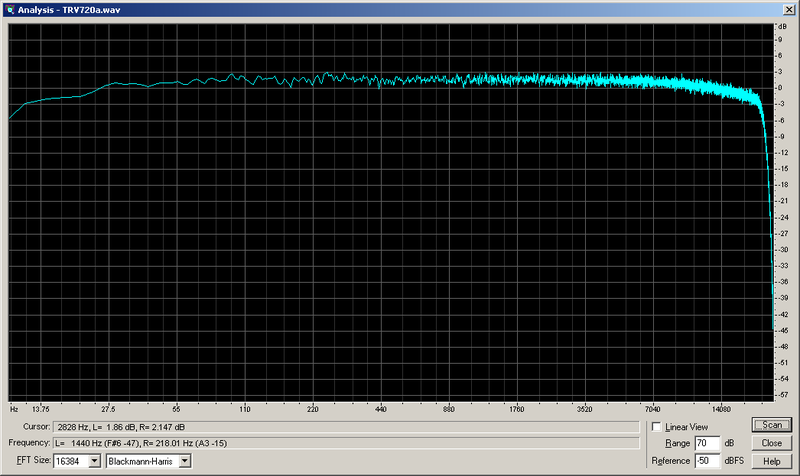 but I can't reproduce the 7 dB amplitude shown here. did not involve my DVRaptor card. This may (or may not) be related to the DVX100 using "locked" audio where all my previous DV cameras were "unlocked." so I've resolved not to worry about it for now. (for their $100 minimum service fee) and the camera was pronounced AOK. on the right-hand edge of the screen. "thin" vertical detail)  note the right-hand side region of vertical lines. 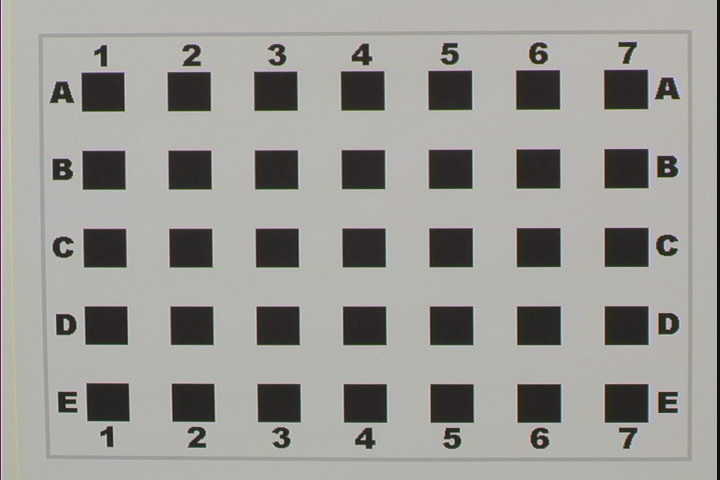 based on this test chart, chroma -5.
is very high resolution but does not have an accurate grey scale- the darker tones are all nearly alike. For a correct grey scale see this page instead. and shot it with the DVX100. Here is a firewire-exported still frame. You will note the presence of some color fringing along the right-hand side of the frame. an electronic problem, rather than an optical problem. skin tone off, matrix cine-like, detail thin, 30p mode. Lighting: afternoon direct sunlight. Manual white balance on plain white sheet of paper. color is nearly impossible to see, but for some reason it is more visible on the computer screen. not appear in manual focus mode. The OIS (stabilization) mode does not affect it one way or another. The noise is not very loud. I thought it might have been louder before but possibly I was mistaken. on my camera, could rattle under some conditions, perhaps amplifying the noise. 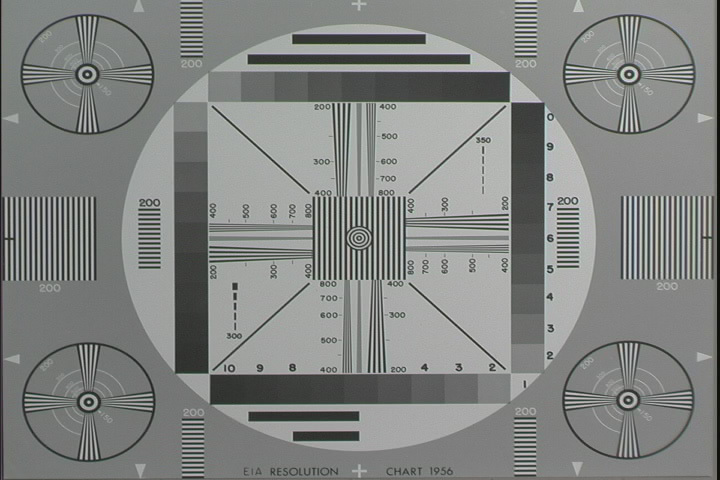 focus ring, connected to channel 1 (left channel) and the camera's internal mic on channel 2.
drives it, and perhaps the camera's autofocus algorithm is not tuned for very low-light conditions. 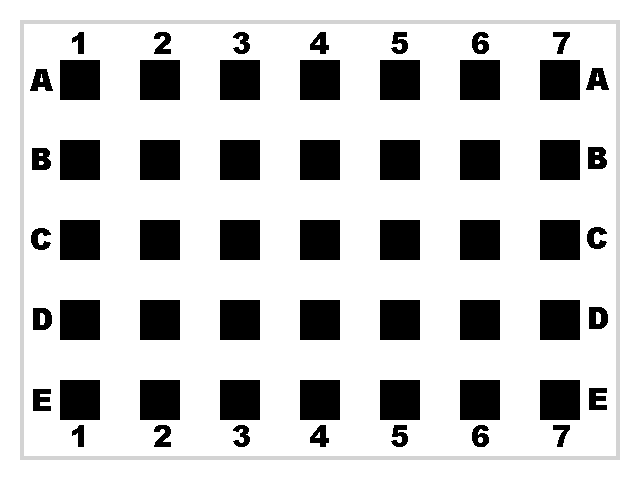 focusing algorithm and/or lens focusing mechanism. this is a NTSC camera and as far as I know there is presently no PAL version available.